Martin Professional is exhibiting an exciting range of unique lighting and fog effects at PLASA 2006, including a number of company firsts. On display at the Martin stand (F54) is the company’s first tungsten lighting fixture, the MAC TW1, as well as the first fixtures in a new LED product range. Another first is a compact and feature-rich laser unit, the RGB Laser 1.6. The companion washlight to the popular MAC 700 Profile, the MAC 700 Wash, also features as do new Mania series lights. On the control side, Martin is showing a new computer based version of the popular Maxxyz console, Maxxyz PC, as well as a compact version of the Maxedia Digital Media Composer. Jem smoke is showing two new products: a new compact version of the industry standard Roadie X-Stream and a new hazer. 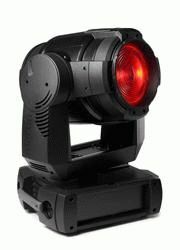 MAC TW1: The MAC TW1 is a 1200W tungsten wash fixture that brings to the stage avant-garde features and patent pending technology to equip the lighting designer with the broadest possibility of effects, colors and design. A twin lens zoom system, full CMY color mixing and choice of internal or external electronic dimming are contained in a sturdy magnesium structure that allows the fast and silent convection of heat away from the back of the fixture. 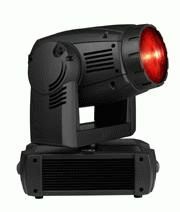 MAC 700 Wash: The companion washlight to the MAC 700 Profile, the MAC 700 Wash is a powerful 700-watt Fresnel luminaire featuring a full CMY color mixing system and variable CTC plus 8 position color wheel. It also includes a wide range variable zoom, continuous and indexable beam shaper, and extremely smooth and fast dimmer shutter system. Its superior optical system produces a remarkable light output, a light quality often better than competitive fixtures with higher rated lamps. LED: With the new Stagebar 54 and LED curtain, Martin brings its vast lighting knowledge and dynamic color changing expertise to the world of LED. Stagebar 54: Stagebar 54 is a bright, high efficiency LED pixel bar with RGB color mixing plus amber and ‘true’ white for a broader color spectrum and greater range of pastel shades than other LED lights in its class. Light output is constant, regardless of ambient temperatures, and different lens angles give greater flexibility of application. Stagebar 54 also features high speed video capability and HSI (Hue, Saturation, Intensity) control. Installation, connectivity and serviceability are all made easy and regulated fan speed ensures outstanding heat management. Industry standard DMX 512 controllable, Stagebar 54 is light weight yet built to withstand the rigors of the touring market. It comes in a small or large version. LUCI 40 LED Curtain: An extremely bright semi-transparent LED wall of light, the Martin LUCI 40 offers true RGB color illumination with color calibration capability. Useful in a wide variety of applications - and specially prepared for TV studios (Genlock) - each 2 x 1 meter module is light weight and easy to assemble. Made of robust materials, and exceptionally service friendly, the LUCI system runs via standard DVI Signal in/Output with simple daisy chain capability. Maxedia Compact: Offering a simple plug and play digital media solution for clubs and retail environments, Maxedia Compact defines the consumer level for the growing media server market. It offers Maxedia software in an attractive and small system designed for powerful video and animation playback and real time manipulation. RGB Laser 1.6: Martin innovation combines with a spectrum of deep saturated colors in a compact laser unit that revives the eighties obsession with laser effects. 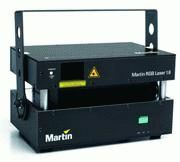 The DMX controllable Martin RGB Laser 1.6 is a unique and hassle-free Class 4 white light laser with balanced cool white that comes in an extremely compact housing – unique for a laser with such power and speed. With simple plug-and-play operations, hundreds of pre-installed effects, and a cooling system that eliminates the need for expensive and bulky water cooling, the RGB Laser 1.6 is all about performance made easy. Mania EFX700: The Mania EFX700 is a stunningly visual, high powered 150W discharge effect light - a dazzling flower effect with an array of vibrant colors, 12 cool new gobo designs and a strobe effect to keep the dance floor jumping. Astoundingly bright for a 150W discharge effect, the Mania EFX700 casts an impressive and widely dispersed display of aerial effects from a rotating parabolic mirror dish. Mania EFX800: The Mania EFX800 is a 150W discharge effect light - a broad sweeping flower effect punched through a rotating glass color paddle. The light output has an amazing 170 degree spread - wider than any flower effect light in its class, which means you can cover more space with fewer fixtures. The EFX800 houses a separate gobo wheel with 12 gobos, rotating parabolic mirror dish, mechanical dimmer, separate shutter for fast strobe effect and pre programmed macros. Jem Roadie Compact: Martin’s industry standard Jem Roadie X-Stream is now available in a high output compact version. Based around the same principles as its big brother, the rugged Roadie Compact features dual, high-output 1.5KW heat exchangers in a powerful fog unit designed for venues that need instant fog or haze coverage of large areas. Capable of casting a variety of effects, the Roadie Compact is DMX controllable and comes with on board controls, remote control, 9.5 liter fluid capacity and more. Jem Hazer 900: Based on Jem’s successful ZR24/7 Hazer, the Jem Hazer 900 is a high precision, continuously operating DMX controllable hazer housing the latest in reliable Jem technology. Capable of delivering an optically translucent canvas of light-enhancing haze for long periods, the Hazer 900 features a 900W heat exchanger and high-velocity radial blower with air-guide system for fine control of haze output, even at minimal output levels.